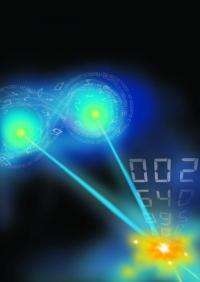 Researcher Helen Chrzanowski operates an experiment at The Australian National University that unlocks quantum discord in pairs of laser beams. (Phys.org) -- Scientists have taken a quantum leap forward towards future computing after discovering that background interference in quantum-level measurements, may be the very thing they need to unlock the potential of quantum computing. In a paper published in todays Nature Physics, researchers from The Australian National University, The National University of Singapore (NUS) and The University of Queensland, suggest that this interference  quantum discord  may be what will make a future quantum computer tick. Up until a few years ago, researchers thought that realising quantum technologies would mean harnessing the most difficult-to-tame properties of the quantum world  the phenomenon known as entanglement. But in the past few years, scientists have discovered examples of technologies that seem to work without entanglement, which has left us with the puzzle of where the quantum power comes from, said Professor Ping Koy Lam of the ANU College of Physical and Mathematical Sciences. Our research has identified that quantum discord, a more robust and easy-to-access phenomenon than entanglement, can also deliver quantum advantage, said Mile Gu, a Research Fellow at the Centre for Quantum Technologies at NUS. The team in Singapore discovered a direct link between quantum power and quantum discord. Weve shown that quantum discord is a resource that we can tap with the right quantum tools, said Dr Gu. The ANU team encoded information onto laser light to demonstrate the unlocking of this quantum resource. Quantum discord has previously been shown to be present in many systems, and might previously have been characterised as unwanted noise. This has made some scientists sceptical that it could be useful, but these results show that discord has potential that can be unlocked for quantum technologies, said Professor Lam. The research team are now looking for other tasks that may be enhanced by the inclusion of some quantum discord, and hope that discord could prove an easier path to future quantum technologies than entanglement.